Good communication is the foundation of getting a better performance from your team. Leadership coach Susanne Madsen shows you how to assess and improve your team’s communication. Susanne started by stating the research of Alex “Sandy” Pentland, of MIT, who studied teams and concluded that they performed at a higher capacity when communication patterns were excellent. What the research means to leading a successful project is that you can apply it to your team members. Know that smaller groups communicate more effectively and be cognizant of how your team is communicating in and out of their group settings. Pro-Tip: You don’t want to control the communications of your team as much as you want to direct them so they’re clear and productive. If you’re too doctoral, the method will backfire. Trust your team to follow these guidelines, and they’ll work wonders for you. Take it further: Watch Susanne’s training video on the Project Leadership Matrix, a tool to help you define your leadership style and how to best communicate with others accordingly. Hi. I’m Susanne Madsen. 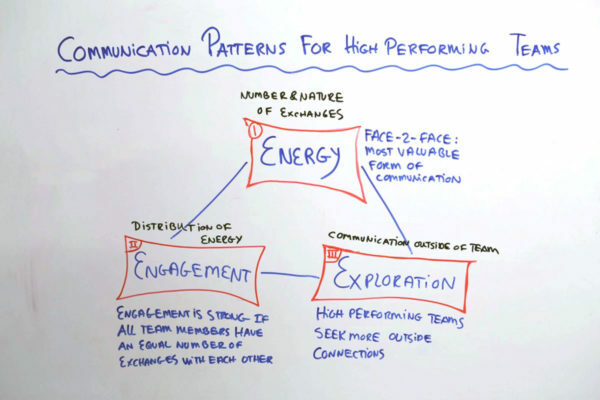 Welcome to this whiteboard session on Communication Patterns for High Performing Teams. Sandy Pentland and a group of researchers at the MIT set out to study why some teams have a consistently higher performance than other teams. They studied 2,500 individual team members across a number of sectors and industries. What they found was the team’s communication patterns was the biggest indicator of the team’s performance levels, more so than their level of experience or intelligence. They looked in particular at three communication patterns, namely energy, engagement and exploration. What they said was that energy is the number of exchanges between team members. What this means is it’s how team members communicate with each other. They also said that face to face, according to their study, was the most valuable form of communication, followed by telephone and video conferencing. Texting and emailing were the least effective forms of communication, which may not sound that surprising. What this means to you is that you need to encourage your team members to communicate face to face where at all possible. If you work with remote teams, encourage telephone conversations, over and above emailing and texting, and video conferencing, but with a caveat. Make sure that there are not too many people on the video conference. That diminishes the effectiveness. Secondly, engagement. The way they define engagement is the distribution of energy between team members. They also said that engagement is strong if all team members have an equal number of exchanges with each other. You need to observe your team and look at how they are communicating. Are there clusters of people who communicate a lot and others who don’t? Are there individual team members who only communicate up to the team leader or project manager but not with each other? You need to encourage everybody’s levels of communication being fairly equal. Thirdly, exploration. The way they define exploration it is communication outside of the team. They found that high performing teams seek more outside connections, especially when we have teams that are involved in innovation. What this means to you is that you must be careful not to be too controlling of your team and make sure that they only sit by their desk without talking to other teams. It can be very beneficial for them to walk outside, explore, seek information, and then bring it back into the team where they disseminate it.